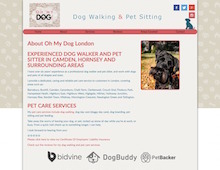 Oh My Dog London is a dog walking and pet care service covering the North London area. We provide dog walking from Camden and Kentish Town to Shoreditch Park, along with pet sitting in Holloway Junction, Hornsey Rise and the surrounding London areas. Any dog, large or small. Minimum one hour dog walking service, our dog walkers are registered and fully insured. We offer a flexible service ranging from one hour to several hours, a whole day, week or even month(s) looking after your dog or pet if you need us to. Collection and delivery of pets at times and a place to suit you. We offer professional and friendly pet care services, with competitive rates, references can be supplied on request. All dog walkers are experienced and local to Camden, Kentish Town, Holloway, Hornsey Rise, Mornington Crescent, Chalk Farm & NW1 area. Every dog walker knows the best and safest dog walks.